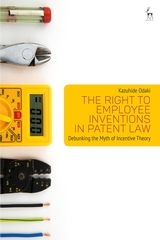 Although employers are required to pay compensation for employee inventions under the laws in many countries, existing legal literature has never critically examined whether such compensation actually gives employee inventors an incentive to invent as the legislature intends. This book addresses the issue through reference to recent, large-scale surveys on the motivation of employee inventors (in Europe, the United States and Japan) and studies in social psychology and econometrics, arguing that the compensation is unlikely to boost the motivation, productivity and creativity of employee inventors, and thereby encourage the creation of inventions. It also discusses the ownership of inventions made by university researchers, giving due consideration to the need to ensure open science and their academic freedom. Challenging popular assumptions, this book provides a solution to a critical issue by arguing that compensation for employee inventions should not be made mandatory regardless of jurisdiction because there is no legitimate reason to require employers to pay it. This means that patent law does not need to give employee inventors an 'incentive to invent' separately from the 'incentive to innovate' which is already given to employers. Kazuhide Odaki has a PhD in Law from the University of Manchester.